Home / Our Blog / I hired an employee – what forms need to be completed? This form is used to verify the identity and U.S. employment authorization of the person you have hired. Every United States employer is required to have each employee fill out this form, including both citizens and non-citizens. Both the employee and the employer will need to fill out this form and the employee must provide any documentation that shows that they have been authorized to obtain employment. This is a form that you keep for your records. The W-4 is primarily used to instruct the employer on how much income tax you should withhold from your employee’s paychecks. The employee should provide this signed form to you immediately after being hired, so you can make the form effective with the first paycheck. 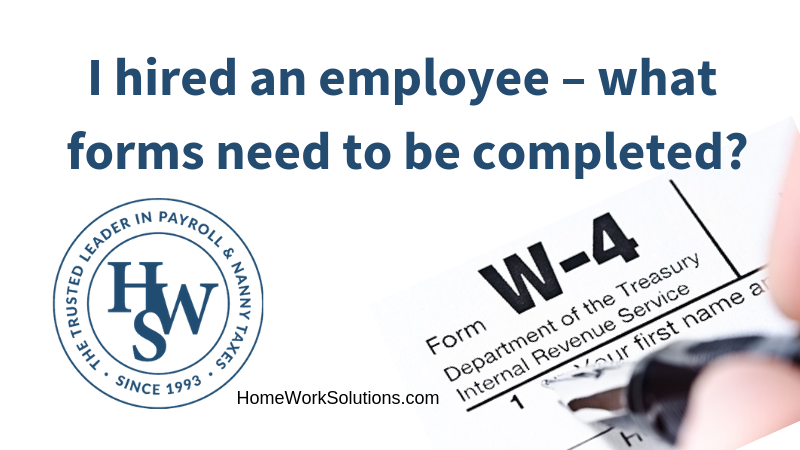 This form stays in effect until the employee gives you a new one and if they decide to claim exemption from income tax, they will need to state this on the W-4. Secondarily, this form also collects the employee's legal name, address, and Social Security Number, all necessary for end of year tax filings. Federal law mandates that all employers must file a new hire report on all newly hired workers and re-hired workers within a specified period, generally 2 weeks, or incur a financial penalty. Each state has designated an agency responsible for the collection of data and enforcement of the requirement. This reporting expedites enforcement of child support orders and protects unemployment and other benefits programs from fraud and abuse. Feel a Headache Coming On? Not sure where to begin when it comes to paperwork, taxes, or paying your employee with the proper taxes and benefits withheld? That’s where our team at HomeWork Solutions can help! Without the right paperwork, you could be subject to penalties or fines from the government. HomeWork Solutions are household payroll experts, and we make the compliance process effortless for families like yours. Contact us today for details on where to begin with what forms need to be completed when you recently hire an employee.